That stage between six and 12 months of a child’s life is a tough one for a parent. Aside from the increased mobility that requires babyproofing and growing a pair of eyes in the back of the adult’s head, many foods can be off limits. Eggs. I love them. Adore them. Packed with nutrients and budget friendly, they’re a staple. I go through lots and lots of eggs. And I want my son to love them, too, but before a baby turns one, health professionals recommend not exposing kids to the egg white, as it contains allergens. So what’s an egg-lovin’ mom to do? Naturally, I turned to Twitter for ideas. 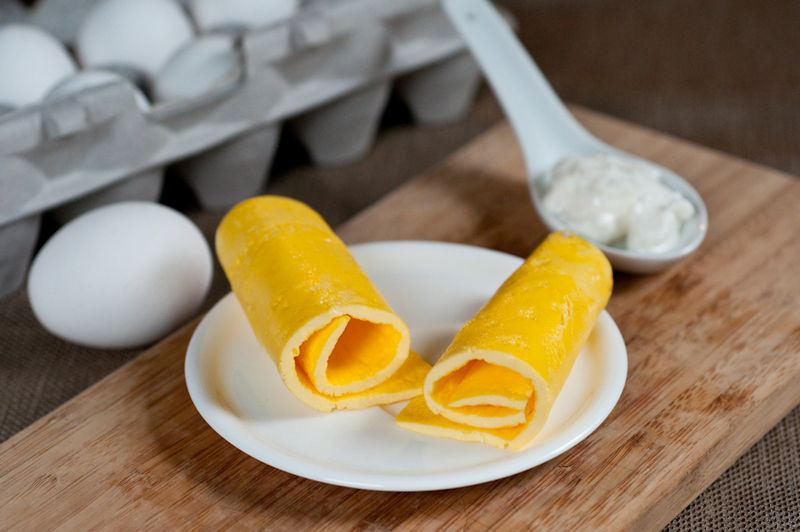 Karou (@kay819) had a great idea to make a tamago-style egg yolk, basically an egg yolk pancake. Separate your egg and retain the white for a future recipe (such as meringues). Heat a nonstick skillet to medium. In a small bowl, beat the egg yolk with milk or formula and a little pinch of salt. Place egg mixture in hot skillet and adjust temperature as needed so as not to burn the egg. When one side of the egg pancake is firm, flip and cook through on the other side. Roll up and slice into bite-size pieces. How do you prepare eggs for your child?